TALLAHASSEE, Fla. — The Earth’s core is an exceptionally difficult place to study. Its depths descend a staggering 2,900 kilometers — about the distance from New York City to Denver — and its extreme, otherworldly conditions are extraordinarily challenging to simulate in the lab. For scientists like Florida State University Assistant Professor Mainak Mookherjee and his postdoctoral scholar Suraj Bajgain, whose lives’ work is to penetrate the mysteries hidden in the core’s impossible depths, these are serious and stubborn roadblocks. 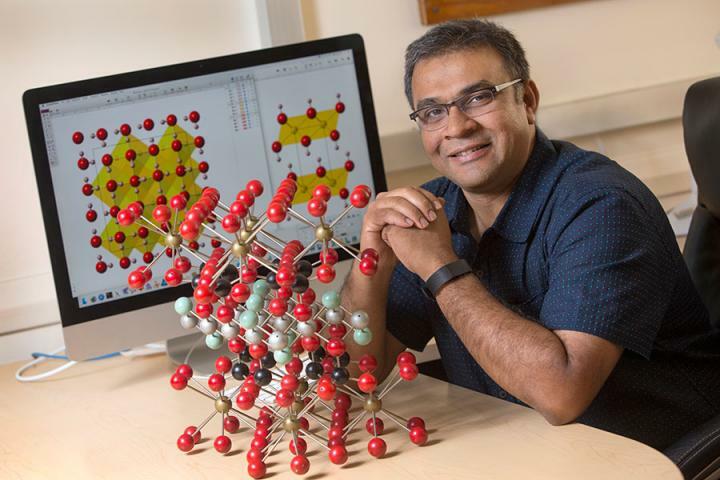 But in a new study published in the journal Geophysical Research Letters, Mookherjee and his team used high-powered supercomputing techniques to sidestep these obstacles and make a critical discovery about the core’s chemical composition. Along with colleagues at Rice University and Louisiana State University, Mookherjee and Bajgain used meticulously calibrated simulations to determine the maximum amount of nitrogen that can possibly exist in the Earth’s outer core: around 2 percent by weight at the core-mantle boundary, and about 2.6 percent by weight at the inner-core boundary. Nitrogen is key to organic matter, and how nitrogen is stored in the planet’s rocky and metallic interior is a crucial but elusive piece of information. Questions of which elements roil in the cauldron of the Earth’s core have long puzzled Earth scientists. Important dissonances in prevailing seismological and geochemical models have gone unexplained, and analyses of meteorites that closely model Earth’s bulk rocky material tend to suggest that we should be seeing more nitrogen in our planet’s interior. These inconsistencies provoke perplexing questions. Mookherjee circumvented the considerable challenges of experimenting at extreme core conditions by simulating those conditions on powerful supercomputers. Using facilities at LSU, as well as the National Science Foundation’s XSEDE facility in Texas, the researchers ran a series of molecular dynamic simulations, which provide critical data on the behavior of liquids and solids exposed to high temperature and enormous pressure. After a battery of benchmark tests to ensure the simulations were running properly, the team added nitrogen to the system. Their goal was to identify the effects of nitrogen on the density and sound wave velocity of liquid iron at conditions analogous to the Earth’s core — readings that would better allow them to determine the core’s nitrogen content. Ultimately, the simulations successfully revealed a first-ever, geophysical data-based hint about how much nitrogen might be trapped deep in the Earth’s inhospitable interior. “Our estimates on the maximum limit of nitrogen in the Earth’s outer core is based on the assumption that Earth’s core is composed of an iron-nitrogen binary mixture, but more research is needed to incorporate the effect of multiple elements alloying with iron,” Mookherjee said. This study was funded by the National Science Foundation, the National Aeronautic and Space Administration and Oak Ridge Associated Universities.